The battlefield has been prepared and the war on Iran is on. November 12, 2011 is the day I believe this war transitioned from a covert action cyberwar (Stuxnet, Duqu trojans) to an overt action conventional war, which itself an escalation in real kinetic terms in a final attempt to preempt a regional unconventional war featuring missile-borne weapons of mass destruction. 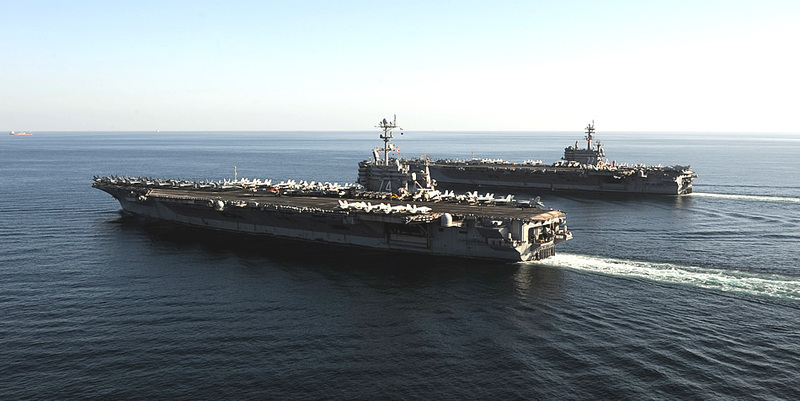 November 12 was the day when two United States Navy Nimitz-class nuclear-armed super-carriers, USS John C. Stennis (CVN 74) and USS George H. W. Bush (CVN 77) steamed in unprecedented fashion side-by-side into the Strait of Hormuz choke-point at the entrance to the Persian Gulf. American aircraft carriers have transited the Strait of Hormuz hundreds of times over the past 32 years, but never in such a bristling array as this. The message to Tehran and Qom was unambiguous as unambiguous gets. November 12 was also the day that a massive explosion all but destroyed the Iranian Revolutionary Guards Corps solid-fuel missile production and testing complex at Al-Ghadeer. The Institute for Science and International Security posted a .pdf report on its website on 28 November that included before and after satellite imagery detailing the near leveling of the base and explaining why the funeral of the IRGC’s missile chief, Major General Hassan Moghaddam and 36 other IRGC officers, was conducted in a closed casket procession. So powerful was the detonation that those caskets might well have been empty and of symbolic value only. Many of the production and testing buildings on the base were simply vaporized. Another explosion at an IRGC weapons depot on the same day not far away also caused massive damage and death to the IRGC missile corps. Recall that a similar explosion occurred at the IRGC’s Imam Ali Air Base Shahab-3 missile storage site in Lorestan Province a year earlier. And ten days later a secret weapons depot jointly run by the IRGC and Hezbollah in an area allegedly under the control of the United Nations Interim Force in Lebanon (UNIFIL) was blown up not far from the coastal city of Tyre. That weapons depot was clearly in violation of United Nations Security Council Resolution 1701, but, as usual, nary a word has been said about that minor detail. Since November 12th the Iranian government has dispatched its Basij street thug militia, the same militia which beat down, imprisoned and murdered hundreds of Iranian student protestors not so long ago, to ransack and burn the Embassy of the United Kingdom and its diplomatic residences. Ambassadors were recalled, staff was sent home, offices were shuttered, you know, all the things that happen as war a between the countries is erupting. Christians who know their Bible should also realize how prophetic all of this is.